I've been coding on Moosy the whole day again, and I've finally reached a stage where 5angel can start making levels. 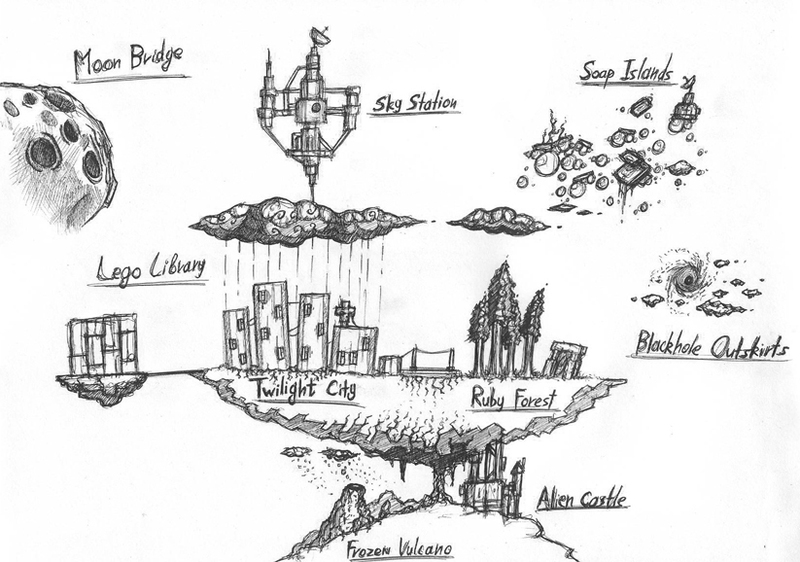 He also came up with an overall map and some concept art that he and I would like to share with you. You can click on the images to get a slightly higher resolution. Here you see from left to right: The Strawberry Zombie Alien, a hanged civilian in the Ruby Woods, an alien and the Alien Castle. On a side note, a new patch for S.T.A.L.K.E.R. is out, so maybe I'll try to play this game once again. I've added a simple project page for Taskless Sheep, with images made by TaskBeenden. Our songs are coming along nicely, and I think in about two months you'll be able to hear more from us. The last three days I've spent about twenty hours on coding for the flash game Moosy. I've added reflections, a key-door system, moving platforms, fundamentals of a new sound system, and cleaned up a lot of code of the original engine. I'm having a lot of fun, also because 5angel keeps surprising me with his art. I'm very happy to play a part in this project. The first book of Antaran's Journal is on the way. When I'm satisfied with it, I'll share information on how it is available for those who are interested. As it looks right now the book will cost about €6, containing about 130 pages, paperback style. And it seems I just can't live without writing reviews, so here is another Quick Movie Review. Enjoy! Squidi started a new website. In 300 days he wants to write 300 game designs. This should be interesting. I suppose there will be a few real gems coming out of this. 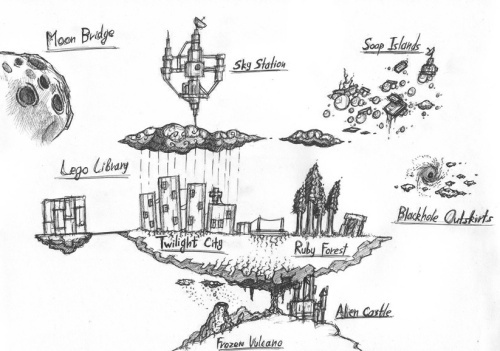 Check out the first game design of Negative Space and I'm sure you agree that it is hard not to be inspired by this. I expect a huge wave of inspiration. 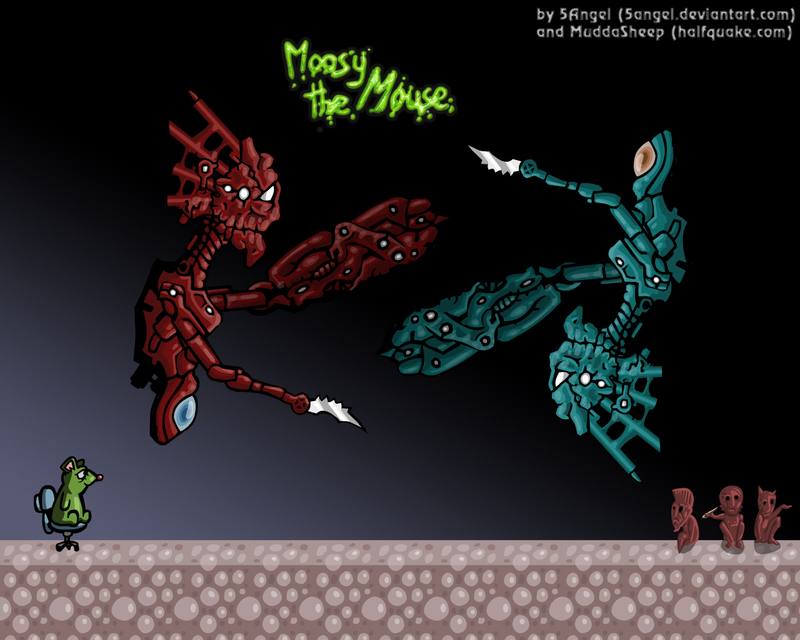 I'm collaborating with 5angel on a flash game now. He's doing the cool design stuff, while I handle the coding side of things. This man's motivation gives me the creeps. And there I thought I was working hard for my projects. But I think 5angel is actually a machine. I've never seen anyone pumping out high quality art at a rate like he does. He also offered help with HQS, so you can expect a huge increase in art quality there as well. I'm truly excited. I've been spending the last two evenings on two songs for Taskless Sheep, so Antaran and HQA Comics have to wait another few days. The thing is, I've been working so hard on these two songs that I was very tired today and overslept once again. I hate it when my body forces itself to sleep and ignore the wake up call. A long day with no results. I've been looking for a notebook, price ranging from 1k to 1.5k and in the end I just gave up again. It's not worth it. Now that I only travel to Vienna and back four times a month I don't see any real reason anymore that would justify such a huge investment, that would get me a machine which is maybe as good as my three year old PC. That's not even funny. The process of correcting and proof-reading Antaran's Journal is at approximately 70%. I think I will even print it out and read it again (when I'm on the train). And I hope cafepress is capable of providing a good printing service. Oh, and I finally decided to get rid of a few DVDs through an ebay auction. My shelves are eternally grateful for being able to breathe again. Here's another thing. Some of you might have already heard about Taskless Sheep. We're three people trying to create music over the internet and we use a tool called EXP Manager. It's basically a homegrown website where we can create new "projects", upload samples and versions of our tracks, and it even includes a forum. The idea is that there's one mixer for every track who basically decides where the track is going, and the mixer and the other musicians add samples, and the mixer creates new versions out of them. The mixer gets decided randomly, or on free will. I don't know how many would be interested in using such a tool to make music without meeting other band members, but if the need exists, let me know. Here is a screenshot. And check out 5angel's deviantart site.